Frank Lloyd Wright knew nature could teach architects a thing or two. Inspired by the contours of the landscape, Wright designed buildings with organic forms. With a similar philosophy, researchers are charting a new course in medicine through the Wyss Institute for Biologically Inspired Engineering, launched in 2009 with the largest philanthropic gift to Harvard in the University’s history — $125 million — from engineer-entrepreneur Hansjorg Wyss. In a step toward creating adhesives, drug delivery systems and other useful tools, Wyss Institute researchers led by Joanna Aizenberg have synthesized nanobristles that self-assemble into helical shapes,which are ubiquitous in nature. The Institute brings together researchers and clinicians from Harvard’s Medical School and School of Engineering and Applied Sciences (SEAS), its affiliated hospitals and nearby institutions, and provides them with funding, space, and expert technical assistance to build on revolutionary advances in engineering, nanotechnology, synthetic biology, and computer science. Although their ideas carry a high risk of failure, they also have the potential to yield big dividends for human health. “We’re adopting the same simple, ingenious design principles that nature uses to create new medical devices and biomaterials,” says Donald Ingber, the Institute’s founding director and an HMS professor of pathology at Children’s Hospital Boston. Wyss teams discard stale patterns of thought by embracing strategies living systems use to adapt and compete for survival. Some of these tactics run counter to what scientists and engineers learn during their formal training. Take nature’s approach to noise. “Nature harnesses noise instead of trying to minimize it,” says Ingber, using natural selection to illustrate his point. Genetic noise — in the form of random DNA mutations — produces populations of cells with slightly differing DNA blueprints and traits. Electrical engineers despise noise and strive to eliminate it from equipment, from radio transmitters to lasers. Wyss researchers recognize that the human body bears little resemblance to a cool, quiet room for computer servers. This complex multi-cellular organism instead resembles an experimental polyrhythmic symphony in which the musicians work from their own scores, yet are flexible enough to improvise. Another Wyss team is developing an assistive device for children with cerebral palsy and other forms of brain injury that isn’t stiff and awkward like a leg brace but instead is as soft and lightweight as clothing. With seed funding from the Wyss, Eugene Goldfield, an HMS assistant professor of psychology at Children’s Hospital Boston, is designing a programmable “second skin” to re-educate an injured nervous system. The skin will be made of many tiny “smart agents” that sense movement and then collaborate with patients’ leg muscles to help them move. “Without prompting from Don Ingber, I probably would have fumbled along on my own for a long time,” says Goldfield. “Don realized it was important for me to connect with robotics experts, so he showed up one day and offered me a ride over to the School of Engineering and Applied Sciences.” There, Goldfield met SEAS Associate Professor of Computer Science Radhika Nagpal, who is interested in robotic systems that adapt like living systems. Her group has created a self-balancing table composed of 12 identical robots that cooperate without guidance from a leader, responding to disturbances to keep the table level. 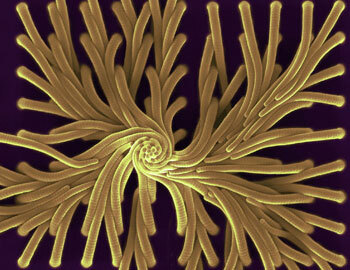 For help in mimicking nature’s principle of self-organization, Nagpal and Goldfield turned to Harvard Microrobotics Laboratory founder and SEAS professor Robert Wood. Wood brings to the project new force-generating lightweight materials that he uses to make insect robots fly. “We need each other desperately,” says Nagpal of the trio’s shared vision, which has drawn them out of their comfort zones. That is, after all, what the Wyss Institute is about: moving bold ideas through a discovery phase to the point where they capture interest — and funding — from government or industry.